Time passes, and I forget birthdays. My blog is one year old, and I would like to celebrate with you, of course, but also with Mathias, who shares my passion for tea. 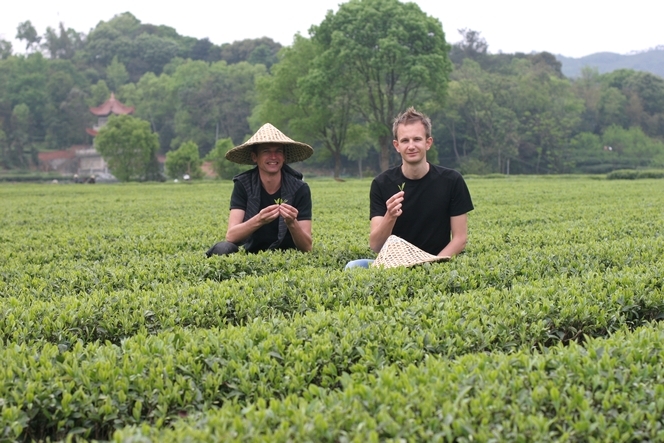 We have worked together for more than ten years, and take great pleasure in tasting the rare teas we love. And sometimes we set off together into the tea mountains, like here, in China. This first anniversary gives me an opportunity to thank you for being there, for making yourselves known from time to time through your messages. Happy tea drinking. Congratulations! Joyeux anniversaire! I’m enoying a cup of your black mango tea at this very moment. Keep up the good work! Congratulations Francois – has been a fun ride so far. Fantastic! You have done perfectly! Keep going, I am behind you!